Last year's national champions, Clemson University, have Head Coach Dabo Swinney to thank for building the Clemson Tigers into a powerhouse over the past ten years. The team has an 89-28 record since he took over in 2008 and has reached the national championship in both of the past two seasons. This season, Clemson University agreed to reward Swinney's efforts with an eight year, $54 million contract extension, making him the third highest-paid coach by annual salary with perks. 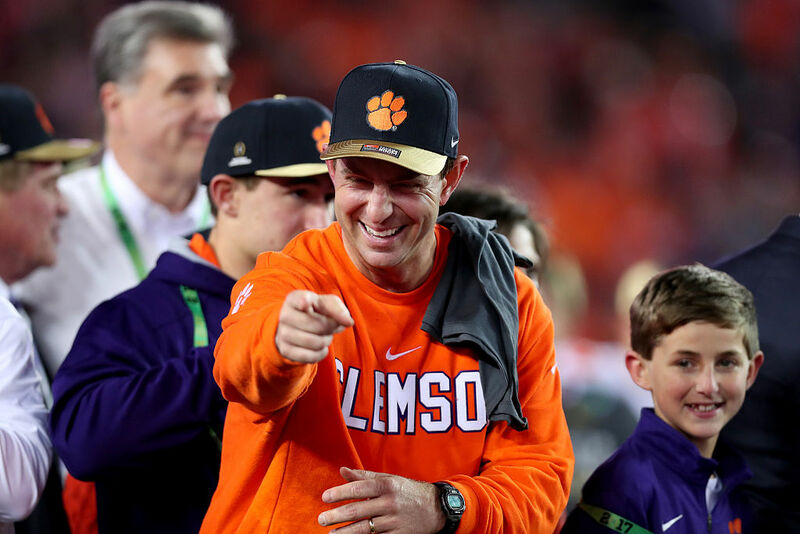 During the offseason, Swinney treated his championship team to a special event where they were invited to watch a special video that showcased the Jostens company facility where they make championship rings. Swinney wanted his players to understand the craftsmanship that went into the rings, with jewelers hunched over a magnifying glass tediously placing each piece (each ring takes three hours of labor to set the stones). The video compared the process to Clemson's final drive against Alabama to take the championship. Each ring has 89 stones in total, a nod to Swinney's winning record and a reminder of the players who came before the championship team. Five are offset, representing the five straight bowl wins. There were three different rings designed, one for the ACC title, one for the national semifinal bowl win over Ohio State, and one for the national championship. To some of the players, it's the bling that matters, but to others, it's simply the meaning behind them. Swinney's new contract comes with a $1.5 million signing bonus and an average of $6.75 million per year, putting him just behind Alabama's Nick Saban and Michigan's Jim Harbaugh. If he keeps up the same level of performance, his contract would likely be revised in a few years, but if he leaves in the next two years, he'll owe the school a $6 million buyout of his contract. The buyout terms suggest that Swinney is loyal to Clemson's program and intends to stay for the long haul.